So I've just finished gathering up my guts to submit this wallie here ^_^ This is it! There's no turning back now! Here's something new from me I guess :) a wallpaper submission using brushes, texture, and effects. In short, a wallie that is not a vector-wallie :P Making these kinds of wallpapers is really not my specialty, sometimes I get lucky with it turning out the way I imagined BUT sometimes, it's just a big epic fail that it seemed like a big mix-up of randomness that doesn't make any sense at all. Anyways, this is one of those decent ones. 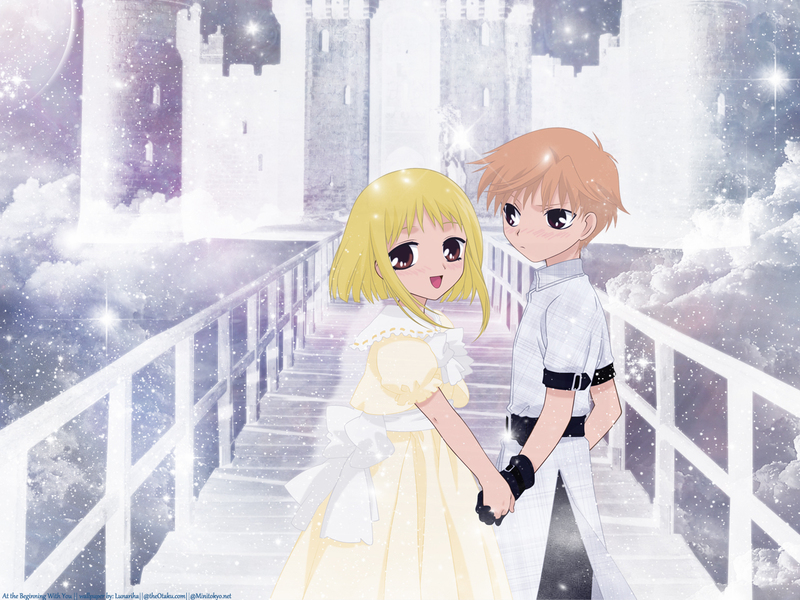 I had this idea of making a sort of princess-and-prince wallie with my Kisa x Hiro vector with a castle on the background. Initially, I was really thinking of making a vector-wallie, BUT I wasn't able to find a castle pic that I can vector. I suddenly came up with the crazy idea of trying to use brushes and textures instead. It was risky...really. :P So I went looking for brushes at DA and came across this castle brush! It was the type/kind of castle that I had imagined for the idea of my wallie. I kinda got stuck after that since I'm thinking of what other stuffs would go well with it. Then I finally decided on something that's heavenly/with this celestial or aetherial feel to it. I also changed the hue (or color scheme or shade) of the vector I used so that it won't look out of place. Also used a light effect on the castle. Musical inspiration: At The Beginning (Anastasia OST) by Richard Marx and Donna Lewis. I just love that song! such an adorable piece. I liked the vector but this one is just precious. you chose a perfect background to suit the two, and even better one of my favorite colors ! and the sparkles just completes it's stage of cuteness. this is the perfect place for sparkles, it's like a fairy tail sort of thing. well done ! The background is wonderful and the color is great i even can't say anything ha ha :D great job! Very cute. I like them holding hands. The castle in the background adds to the charm.